Houston, TX - July 19, 2017 - AcctTwo, a leading consulting firm and provider of cloud-based ERP, FP&A, and Managed Accounting Services solutions, announced that the firm has hired Malcolm McKee as its Director of Software and SaaS. 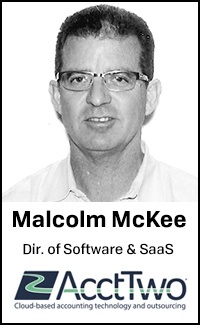 McKee's role will be both a strategic and tactical one, helping manage the delivery of consulting services to AcctTwo's software clients, as well as guiding the firm's overall strategy in providing software and SaaS companies with the most effective suite of business software, consulting, managed services, and analytics tools available. Houston, TX - October 24, 2016 - AcctTwo, a leading consulting firm and provider of cloud-based ERP and Business-Process-as-a-Service solutions, announced that the firm has developed the Advanced SaaS KPI Dashboard to provide key business information to Software-as-a-Service business leaders using Intacct's accounting and ERP platform. As the subscription economy grows, subscription-based software companies find themselves with the need to measure an array of new metrics that include both financial and operational data from their accounting/ERP systems to their Customer Relationship Management (CRM) systems. The Price of Business - Marcus Wagner answers "What is SaaS and why is it better?" How is "the cloud" a fundamental change in the way companies use software? What is multi-tenancy and the difference between SaaS and "hosted" cloud? How is SaaS like the power utility, or Netflix, or any superior trend in technology? Intacct today announced the addition of a new social platform to its cloud financial management and accounting software. This new offering will embed Salesforce Chatter, the leading enterprise social network, into Intacct to create a secure social layer across all finance processes. This integrated solution delivers unprecedented levels of communication and collaboration across front and back office employees. The Houston Community ToolBank is a local nonprofit organization affiliated with ToolBank USA that will steward a vast inventory of actual tools for use by charities to advance their missions, increase impact, and reduce costs. ToolBank USA began its mission in Atlanta, where the Atlanta Community Toolbank celebrated its 20th anniversary in 2011, and now equips over 45,000 volunteers with tools every year. Director of Marketing and Business Development for Accounting and Financial Management Technology Firm Receives Much-Deserved Recognition. AcctTwo, a leading provider of cloud-based accounting technology and business process outsourcing to small and medium-sized companies, announced today that John Silver, AcctTwo's Director of Marketing and Business Development, has been named Salesperson of the Quarter (Q3/2013) by Intacct Corporation, the fastest growing provider of on-demand financial management and accounting software. AcctTwo, a leading provider of cloud-based accounting technology and business process outsourcing to small and medium-sized companies, today announced that it has been named Partner of the Month for August 2013 by Intacct Corporation, the fastest growing provider of on-demand financial management and accounting software. AcctTwo, a leading provider of cloud-based accounting technology and business process outsourcing to small and medium-sized companies, today announced that it has been named to Intacct's 2013 President's Club, earning the prestigious award for the second year in a row.